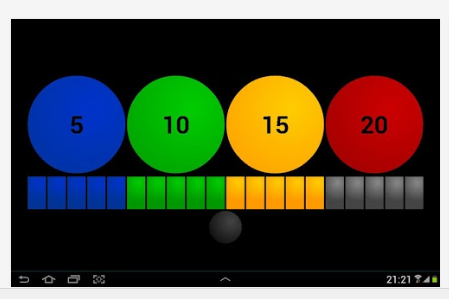 Visual Timer app for iPhone/iPad (2.99) provides a vertical, linear visual countdown. 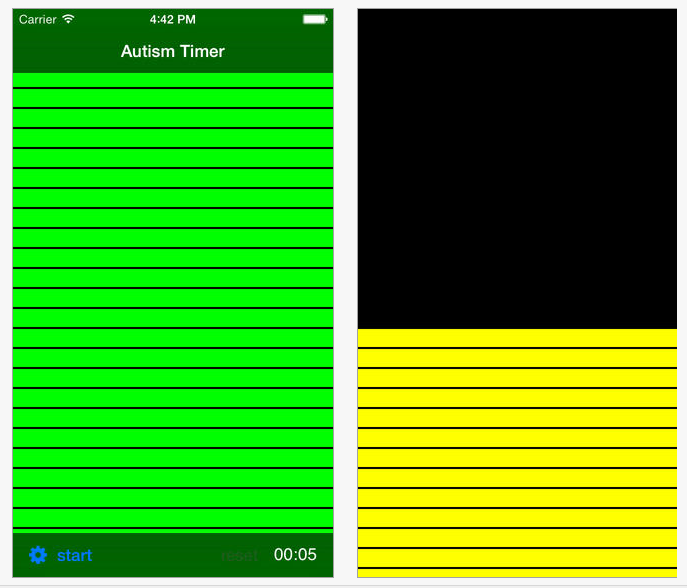 The green, yellow and red colors can be set for a specific time from seconds to hours. I did not download this app and could find little information on other features, such as if it runs in the background , or if the alarm will sound if used in the background of other apps (anyone ?). If you wanted the horizontal countdown, locking the screen and laying your device on the side might be an option. The free Visual Time Timer app (above) provides countdown time only in increments of 5, 10, 15 and 20 minutes. Time can be paused and restarted in those increment using the gray ball at underneath the countdown strip. The Visual Time Timer Premium version (for 3.85 ) allows setting customized times with the same countdown visuals. The app must be open for the alarm to sound. I downloaded the free version which is limited as aforementioned to the 5, 10, 15 and 20 minute times with no other menu options available in the app. Little other information was available following search on the Internet about the Premium version to determine the minimum or maximum available countdown times. Anyone know of any other apps with linear countdown features like Waitstrip for iOS or Android? Please share. This entry was posted in Android, App Reviews, Apps for OT's, Apps for Special Needs, Autism, Developmental Delay, Free apps, iPad, iPhone, iPod, Occupational Therapy, Visual Communication. Bookmark the permalink.